1) Thanks to class of ’15 and WA for the tip. 2) Does EphBlog share some of the blame here? That is, would Horn have resigned if we had not published the story? I don’t know. The timing certainly suggests that this is true, since the resignation came the day after we published. Moreover, the underlying news — the guilty verdict — came out more than two weeks ago. Did Horn fail to inform the College? Or did she inform Williams, but Falk and the trustees hoped that the story would never come to light? Surely, someone knows the inside story . . .
3) How was the message distributed, if at all, to the Williams community? In particular, did an all-campus message come out? If not, how did WA and class of ’15 come across it? Normally, a search of the opening phrase of a Williams news release pulls up that release as its first hit. Is the College using some robots.txt-fu to keep this news hidden from the world? Should it? Almost instantaneously after publishing this post, the same Google search now pulls up EphBlog as the first hit. In other words, Williams is almost certainly doing something to cause Google not to index its own announcement. Can any of our technical readers explain how? EphBlog shares little of the credit/blame here. I know thirty people that called various members of the administration to express their displeasure. This was shared widely on social media amongst members of the most recent 15 classes. Thanks WA to you and the others who communicated to the administration. Sad story, but the right outcome. I think DDF has the right to claim some credit here…as you do… for raising the visibility of this sordid matter. Given the extraordinary skill of the Williams College fundraising staff, I think the Falk administration must have known about this au pair scandal for years, certainly well before they opened the doors of Horn Hall to a new generation of social justice warriors. I’m confident Falk probably procrastinated in getting rid of Joey Shaista Horn ’87 because there had been little public pressure from anyone to take action. After the Ephblog article came out, I cited it in one of my own blog posts and started tweeting it out with the hashtags #WilliamsCollege and #Ephblog. If I had more time, I would have submitted the story to either Campus Reform or the College Fix. 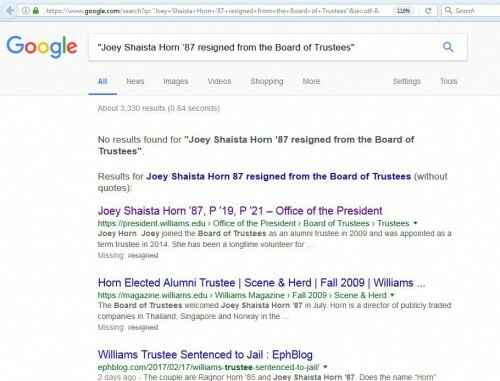 I was happy to do what I could to facilitate her resignation by calling attention to the insensitive globalist values of Joey Shaista Horn ’87 to my approximately 77,000 Twitter followers. Now, I think it is time for Adam Falk to return her $10 million gift and scrape her name off that new residence hall. Can you provide more details on the timing? I am not interested in credit/blame but future historians will want to know the time line. Prior to Feb 4 and the publication of the article: No one outside of the Administration (if them?) knew about this issue? Feb 4: Article is published. Who (outside the Administration) first noticed this? How did they spread the news? When did that happen? Feb 16: You post a link on EphBlog. Is it correct that many/most/all of the people you know who contacted the Administration did it before Feb 16. Feb 17: Main EphBlog article. CTA also published an article, which I think derived from your comment. Or did they get in someplace else. Williams posts news, dated Feb 17 and claiming that Horn had resigned effective the 16th. It is not clear to me when that post when up. Anyway, the more details we can capture, the better. Hmmm. Now the Google search behaves as we would expect. It pulls up two items: the College age and this EphBlog post. Two possibilities: First, this is just random internet/Google weirdness. Second, the College saw this discussion and decided that trying to hide the result from Google searches was counter-productive. Informed commentary sought! But for EphBlog, the sun will not rise in the East tomorrow morning. This has been enlightening reading. The puzzle, of course, is why the board of trustees consented to naming the new Horn Hall after this nefarious couple even though news of their arrests was freely available as early as December 2014. Based on my experience with non-profit boards, I suspect that Joey Shaista Horn ’87 is indeed, as one of her au pairs described her, a perfectionist. It seems reasonable to me that this character flaw is one of the reasons she held on to her position as a trustee even as her husband was resigning left and right from his board-level commitments. She seems less willing than her husband to admit she made a serious mistake – punishable by incarceration and fines – and to accept the consequences of her poor decisions and lack of empathy. I think a healthier person would have resigned immediately, citing personal reasons, knowing the consequences this scandal would have for Williams College’s reputation. It may also be that Williams College tolerated (or even excused) Joey Shaista Horn’s contemptible behavior out of a misplaced sympathy for her cultural heritage. Unfortunately for her Filipino au pairs, not all aspects of Indian culture are as pleasant as the classical dance routines Joey Shaista Horn brought to campus in the late 1980’s. Sadly, Indian culture has made it tolerant of holding the largest number of enslaved people in the world. As I understand it, a little over 18 million people — about the population of Chile — are still victims of contemporary slavery in India. Frankly, I do not think it makes sense to neglect the contribution of Indian culture to her behavior. The au pairs report that they felt like “slaves” while they were in her household. Her own husband indicates that she was the one responsible for administering the au pairs. She certainly did not pick up her calloused attitude toward her au pairs from anything she learned in either European or American culture. My guess is that she lasted as long as she did because she is a powerful board member, that she held on to avoid embarrassment, that her globalist vision is perfectly aligned with her fellow trustees, and that they were willing to cut her some slack because demanding her resignation would remind us all that cultural diversity is not necessarily a good thing, especially when one’s received culture is relatively tolerant of the enslavement of others. Finally, I suspect we will see that she is involved with other trustees at Williams College in ways that have nothing to do with the school. She may, for example, have been using her trustee position to market investment products to other trustees. It is entirely possible that she has entangled herself in their other business or charitable work. I predict her downfall will ensnare other trustees – as well as faculty and staff – as it becomes more and more clear which of them knew about her dark side and which of them failed to confront it. I’m glad that despite your incredible academic and professional success you still grace us with however long it took to write that. That’s sarcasm, I’ll say, since it doesn’t always come across. I found out Feb 14 or 15. Most people I know contacted Feb 15, 16, or 17, but do not read EphBlog. If CTA is student led I would guess it didn’t derive from my comment – my understanding is that students on campus were/are discussing this. Oh, there’s more. It turns out Joey Shaista Horn ’87, who was based in Singapore when she came on board, was the very first international trustee. She was, initially, a triple affirmative action victory – Indian, female and international. In retrospect, I think she will soon be regarded as one of the trustee’s biggest mistakes. Maybe there should be a special trustee position set aside for the morally bankrupt/recently incarcerated? NOTE: As a professional fundraiser myself, I would start picking away at this tangled mess by asking who on the development staff knew about her arrest in December 2014? I suspect that the folks who were taking credit for her $10 million gift had little incentive to shine the light on her creepy backstory. The Horn matter will be forgotten faster than the Indians’ participation in the 2016 World Series. As of 7:42 pm 2/21/17, no all campus email has been sent to the student body. The first article that mentions the involvement of Joey Horn (referred to as Ragnar Horn’s wife and not by name) this 2017 is from Jan 3. Notably, the article says that the trial for the accused (the two Horns and their two friends) “began Tuesday” which implies that the trial began that very Jan 3 – a Tuesday. This means that Joey Horn was already implicated in this by then, and yet did nothing until now when they were handed a verdict + news of their crime spread. Falk will do everything he can to protect Williams s̶t̶u̶d̶e̶n̶t̶s̶ trustees. Unfortunately, at Williams College, the worst forms of mental illness including self-destructive narcissism can be easily tolerated as long as they are cloaked in leftist ideology and the balm of identity politics including one’s status as either an Indian, female or international participant. The high level of mental illness among students at William College would probably shrink to nothing if the campus abandoned its out-of-touch cultural Marxist ideology. EphBlog is powered by WordPress and delivered to you in 0.834 seconds using 36 queries..